Tom DeLonge will release previously unheard Blink-182 demos next month, he’s announced. The ex frontman left the group last month, insisting he hadn’t quit – despite drummer Travis Barker and bassist Mark Hoppus saying otherwise. 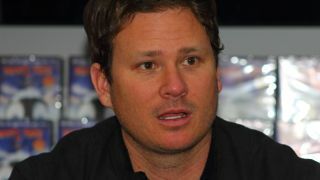 The public spat then intensified with DeLonge claiming that he and Hoppus had previously discussed ditching Barker – comments that the bassist quickly played down. Earlier this month, he claimed his belief in UFOs has put his life at risk, while his band Angels & Airwaves issued their fifth album The Dream Walker in December. Meanwhile, Blink have lined up an appearance at the Musink festival in California next month. They’ll play with Alkaline Trio’s Matt Skiba in DeLonge’s place.